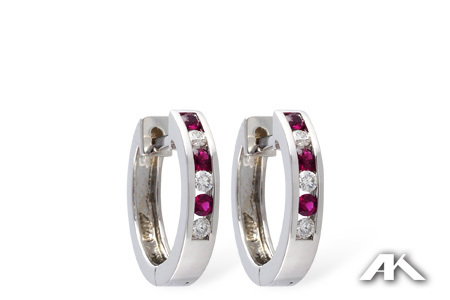 These hoop earrings feature .10ct total weight in round diamonds and .16ct total weight in round rubies channel set down the front. Huggies are a style of earring with a hinge at the bottom. They click into place audibly for a secure fit, and are smooth and strong enough to be worn to sleep. An elegant staple of any wardrobe. We always carry a nice selection of Hinged Huggie Earrings, many styles, colors, various gemstones, or no gemstones, come see our selection. These earrings are available in other metals and carat weights; please call or email us for additional information.